Water filters have become necessities rather than luxuries. More and more reports are being published that tell us our homes are slowly killing us. The only answer we know of so far is to use high quality air filters and waters filters. If you're reading this, you probably know this already. However, you may not realize the terrifying magnitude of our situation. Below, we've listed just a FEW of the most insidious contaminants we know are present. The need for clean, energized water is paramount for anyone wishing to achieve true wellness. This is especially true for those people facing illness. Removes BROADEST Range of Toxins! 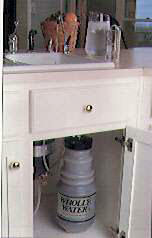 Whole house water filter also available. By the 1980's, production of synthetic chemicals was up to 500 billion pounds. And 1000 new chemicals are introduced each year. Yet the Federal Safe Drinking Water Act only addresses 100 contaminants! “Drinking water plants are old and out of date, and water supplies are increasingly threatened by and contaminated by chemicals and microorganisms.” - Natural Resources Defense Council. The World Health Organization and the National Cancer Institute both suggest that most human cancers, perhaps as many as 90% are caused by chemical carcinogens in the environment. "Weed killers were found in tap water of 28 out of 29 cities tested... the results of these tests reveal widespread contamination of tap water with many different pesticides at levels that present serious health risks... we estimate that 45,000 infants in these 29 cities drank infant formula reconstituted with tap water contaminated with multiple weed killers." - Environmental Working Group report, "Weed Killers By The Glass"
"Each year in the U.S., lead in drinking water contributes to 480,000 cases of learning disorders in children and 560,000 cases of hypertension in adult males." - U.S. EPA Report summary. "Each day, millions of Americans turn on their taps and get water that exceeds the legal limits for dangerous contaminants." USA Today, Special Report "How Safe Is Your Water?" See more about our polluted water supply. Arsenic, Antimony, Asbestos, Barium, Beryllium, Bromate, Chlorite, Cadmium, Chromium, Copper, Cyanide, Fluoride, Chlorine, Chloramine, Chlorine Dioxide, Disinfectants, MTBE (fuel additive), Total Trihalomethanes, Haloacetic Acids, Microbes and Parasites, Pharmaceutical Drugs, Radionuclides, Radon, Combined Radium 226/228, Beta/photon emitters, Alpha emitters, Inorganic Contaminants, Lead, Mercury, Nitrates, Nitrites, and more. Water is an amazing substance. It is far more complicated than most people realize. We urge you to learn all you can about water. It is a vital key to health and wellness. Below are some of our favorite water enhancing gadgets. To really understand what water can do for you, please read these pages. As we stated before, CLEAN water is paramount; then you think about revitalizing it. Rejuvenate your water to rejuvenate your body! Super cellular hydration and revitalization. 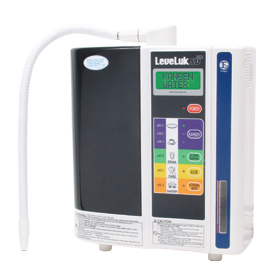 Increased Oxygenation at the cellular level. Enhanced endurance and reduced recovery time from strenuous exercise. Activation of enzymes, immune system support, and greater metabolic balance. Electron-rich free-radical neutralizaton and cleansing. Please read full disclaimer here. These statements about water, water filtration, water filters, water filtration techniques, etc... have not been evaluated by the Food and Drug Administration. The information contained here about water filters is not intended to diagnose, treat, cure, or prevent any disease. Suggestions and ideas presented in this document should not be interpreted as medical advice, meant for diagnosing illness, or for prescriptive purposes. Readers are encouraged to consult their health care provider before beginning any "alternative" protocol. The information in this document is not to be used to replace the services or instructions of a physician or qualified health care practitioner. Water filters page.